» Cancer Health Disparities Research: Where have we been and where should we go? Cancer Health Disparities Research: Where have we been and where should we go? Dr. Scarlett Lin Gomez is a Professor in the Department of Epidemiology and Biostatistics and a member of the Helen Diller Family Comprehensive Cancer Center at the University of California, San Francisco. She is also Director of the Greater Bay Area Cancer Registry, a part of the California Cancer Registry and the NCI Surveillance Epidemiology End Results (SEER) Program. Her research focuses primarily on cancer health disparities and aims to understand the multilevel drivers of those disparities. She has contributed surveillance data regarding cancer incidence and outcome patterns and trends for distinct Asian American, Native Hawaiian, and Pacific Islander and Hispanic ethnic groups, as well as cancer patterns by nativity status and neighborhood characteristics. 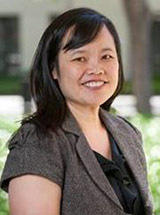 She developed the California Neighborhoods Data System, a compilation of small-area level data on social and built environment characteristics, and has used these data in more than a dozen funded studies to evaluate the impact of social and built neighborhood environment factors on disease outcomes. Since 1996, Dr. Lin Gomez has received many honors and awards, including being named Author of the Year in 2010 by the American Journal of Public Health, the Above and Beyond Excellence Award in 2012 and the Mentoring Award in 2014, both by the Cancer Prevention Institute of California. She completed her education in epidemiology with an MPH at the University of Michigan, Ann Arbor, and her PhD at Stanford.